I received an email saying that there was an exchange program for the USB power adapters that were sold with the iPhone 3G. 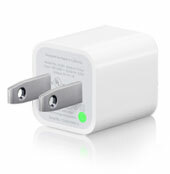 I took a look at Apple’s website and it seems that the Ultracompact USB Power Adapters are being recalled. Apparently there have been reports of the metal prongs breaking off and remaining in the outlet…that sooo cannot be good!! If you bought an iPhone 3G in the following Countries, you qualify to receive a new USB Power Adapter.